UPDATE: You can get replicas and prints from the artist. Details HERE. It is called Melancolie. And it is heartbreakingly beautiful. 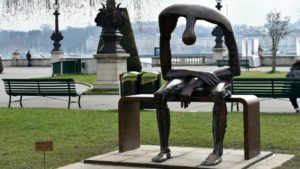 The artwork created by Albert György (living in Switzerland, but born in Romania) can be found in Geneva in a small park on the promenade (Quai du Mont Blanc) along the shore of Lake Geneva. Millions (more than 11 million people) have viewed it from our Facebook Page so we wanted to take a few moments and share more about the sculpture and artist. György was born in Romania in 1949. He lived in isolation and sadness after his first wife died, so he understands grief. He was given what he calls in reports – a second slope of his life where he is able to enjoy freedom. The sculptor developed a special alloy of copper and tin which he used for his work. UPDATE: A MESSAGE FROM THE ARTIST! Totally on point! As The mother of a deceased son… This beautiful piece of art says it all ! Thank you ! Absolutely, spot on, this powerful piece of art captures the feeling we try so hard to hide. I picked your comment because I feel exactly the same way you do about sculpture the artist depicted. I would love to buy a print of this art. This piece of art says it all. I too am the mother of a recently deceased son. My heartbreak continues because my son and his wife are expecting their first baby this September and my son will never know him. It will be bittersweet. I understand that. Our daughter was 21 and pregnant with her second baby. She left behind a husband and 8 month old. He’s now 2. All I can say is your grandchild will know him through you. It’s not the same but it’s all we can do. We show them who their parent was and tell them all we can! God bless you! It will be 2 yrs this month since we lost our son, Dave. He is in my thoughts every day & I live with this huge hole. Then I read many of the other parents comments & I felt their pain as if it is my own. I would love to have a print of this. have lost a child can understand such pain. I am so moved by this sculpture. I am a grandmother who lost my beloved 22 year old grandson 1 year and 5 months ago. It’s as though there is a hole in my soul every waking moment. I have no energy to be around people and have to pretend that all is fine. Thank you for sharing this. I don’t feel so alone in this nightmare knowing that someone else understands so clearly, and created such a piece to show what life is for me now. And,for all those others that have lost their most treasured being. I just want to see him laugh beside me. I feel your Sadness and pain. Im praying for you. Having lost all three if my children, this piece of Art expressed for me how I felt. Empty, despair and hallow. I am so moved by this sculpture as I lost an adult son last Fsll. I would love to buy a print as soon as possible. Thank you Beverly for finding and sharing Mary’s post and site regarding the sculpture. This is how I feel everyday. It feels like your heart and soul has been stripped from you. Two days and it will be nine years,but feels like yesterday. I am so sorry for your loss. We are working on prints and will keep you posted via this blog. Thank you. The pain is excruciating. Our hope is this is a bend in the road and not the end. We will see our children again. I picked your comment to reply to and to offer you and your family my thoughts and prayers today. Due to the sudden death of a family member, I was drawn to the sculpture in a post and followed it here and found your comment longing for Aaron. God bless. My mother lost both her sons at early stages – the eldest in his 40’s and the youngest in his 50’s. She tried so hard to come back from the dark edges for her daughters (3) but we all knew how difficult it was for her and when she died 5 yrs later with her girls around her we knew she was happy to go to see her sons and husband. My heart still remembers the look in her eyes of joyful happiness that she was able to leave us quietly and with each other for comfort. The sculpture just shows emptiness and yet strength. Beautiful! Lost my boy Adam 3 weeks ago.. He was 7. Just had his birthday. Have to carry on for my two girls, but the hole stays there. I am so very sorry for your unimaginable loss. Loved this sculpture! Very emotional work. This may be the most heartbreaking sculpture I have ever seen. This is the most poignant expression I have seen in the many years I have been a bereaved parent. It depicts the emotion and feeling of the emptiness yet strength a bereaved parent feels living in a world not meant for their children. Thank you so very much. Very true I have been 35 yrs since my daughter died and i’m still in shock and miss her so much. I have a son who misses her too! 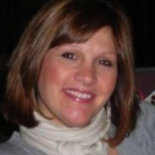 I love your remsrk…”It depicts the emotion and feeling of the emptiness yet strength a beresved parent feels living in a world not meant for their children.” We lost our 47 year old daughter this past May. I thought about how the sculpture frames the sky… all the hopes and dreams and plans that will never graduate from the “to do” list. And you are so right about the birds, the basket, the spiders, the webs… all those would be successful metaphors for some aspect of living with this space in the heart where none should exist. I have never before seen or done a sculpture that expresses this feeling so directly. It is brilliant. Had it been my concept, I don’t know if I could have done it. It hurts just to look at it…the way it hurts to push on a sore tooth…like you NEED to push on it. Yep… 25 years, 3 weeks, 1 day since my eldest son died…and the world keeps turning around me. I, too, lost my son, Phillip. He died suddenly last year at age 20. This sculpture embodies my existence. A seemingly “normal” life surrounding a gaping hole. Although a hole is considered empty, mine is filled with everlasting grief. My grief is love for my son in death, as I loved him in life-fully,completely, with each breath and every beat of my heart. My grief remains because my love never ends. Your comment saying a world not meant for our children hit me like a ton of bricks! My son was meant for this world! Bad events happen. He should be here! Our son died 11 years ago this Oct. He was 26 and traveling around Asia. He bought medicine from what was advertised as a pharmacy. The medicine was counterfeit and killed him. This piece is so perfect. I too would love a print, if one is available. How awful for you. My 25 year old daughter died due to a team of doctors in this country who didn’t know what they were doing. She didn’t have to die. Love this. Where can I purchase a print ? My son died less than a year ago and this piece is probably the first time I can relate to something. Looking at that sculpture, I feel understood. Please let me know how I can purchase a copy. Thank you so very much. I am so very sorry for the loss of your son. I do not know of any copies, prints or smaller versions of this beautiful statue. So sorry. Would like to have a print. Lost my son at 38. Lost my grandson this year to suicide. Combat medic Afganastan….. This figure is so powerful and also to me, reflects how my grandson must have felt leading into his death. Where can I purchase a print? I love this sculpture. It speaks volumes to what I feel since losing my son Ryan. We were close and I miss his hugs and I love yous. I also love the wall art of this sculpture on canvas I believe, with the res background. Is there a print available for purchase.? If so, the cost please. I would like to purchase a print as well. Please direct me to the website to do that on. So powerful! I would love to purchase a print. Send info on purchasing a print. Thank You. Where can I purchase a print or similar?? I am sorry, but I don’t know of any prints available. I lost my son in 2003. He was 28 yrs old. I would love to purchase a print or a small sculpture. We lost our only son Gary he was 29. We miss him so much it hurts. 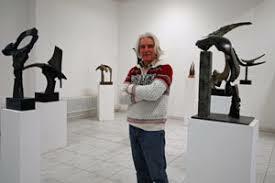 Your sculpture absolutely depicts how we feel and our life. No one will ever understand the emptiness we feel of losing a child. It’s a beautiful piece of art thank you ? My son was taken from me and murdered as well this year! This peice shows the strength you have to endure when you feel empty on the inside!i am sorry for you loss! I’m so sorry for the loss of your son. My son was also murdered. It was on July 15, 1993 at the young age of 10 by a convicted child molester. I passed a law in Indiana called “Zachary’s Law” but that didn’t cure the pain. It doesn’t seem to ever end. This beautiful but sad sculpture captures that feeling. ? I lost a daughter over 6 and a half years ago aged 37. Later on, my marriage broke up, my children and I have been left shattered. I can totally relate to this sculpture. I often feel as if there is a big hole inside me. Hi Shirley, I am so sorry for your loss. I pray that your memories of your son will bring you through these dark times and you will be reunited again one day???? This is about the closest visual to depict how it feels. My Son passed away last year. That empty space NEVER goes away. Levi was a beautiful soul. Our Son was murdered in his home by a gang member attempting to break in. A resolution has been past in the state of California as January being ” Gang Awareness” month thanks to a friend that begin a program called Mother’s and Men Against Gangs (MAG). In order to make the community aware of gang violence. Our Son was murdered in his home by a gang member attempting to break in. A resolution has been past in the state of California as January being ” Gang Awareness” month thanks to a friend that begin a program called Mother’s and Men Against Gangs (MAG), in order to make the community aware of gang violence. Join with us today in passing a similar resolution in your state. However the death of a child or loved one can be very devastating, as it has been for our family. Are there any pictures or sculptures for sale that you know of. This truly hit a raw nerve. I love this. This sculpture truly captures that empty feeling. My 5 month old son died in my arms 3/3/02 and even though I had another son there will always be a void that can never be filled. I love this sculpture My daughter passed away last year and this is exactly how I feel Can u buy prints or mini sculpture of this statue ? I lost two children. This comes closest to the way I feel. I am so very sorry for your loss. I am sorry, but I don’t know of any prints available. I am so sorry for your unimaginable loss. I do not know of any copies, prints or smaller versions of this beautiful statue. So sorry. Looking a child doesn’t tear s hole in your heart…it rips apart your soul. I would like a picture or sculpture of this also for my son and daughter my son lost his grandson of 4 month and my daughter lost her daughter to lukemia a week later last year in a October if you get any info please let me know. I am sorry for your loss as well. I am a grand mother in grief. Thank you for sharing. May God bless you and strength you every moment of every day. This is so evocative of how I feel almost 14 years after losing my 23 year old son. He would have been an uncle, and so many things he has missed, and we have missed with him. There is no word for us bereaved parents in any language that I know. That emptiness can never, and should never, be filled. It truely portrays the pain of losing a child. I loss my beautiful daughter and grandson last May. My world has a whole in it. My heart is broken and the pieces are loss. This sculpture says it all… “a picture is worth a thousand words”. Three years ago tomorrow our son Gary died of an undiagnosed heart condition.I feel so very empty and sad and every day is a struggle to try to be “normal”. This sculpture truly reflects how I feel. Hilary, I too lost my son, Corey, to an undiagnosed heart condition. He was 24 and had a heart attack while on a business trip to San Francisco. He was all alone in a hotel room. It has been 4 + years. I know exactly how you feel. I have experienced much loss in my lifetime. I lost my parents when I was a child. I have lost siblings, best friends! I lost a newborn grandbaby & losing him was the worst until May26, 2017 when my son passed away! It was his baby whom we had lost a few years before. Losing my son has broken me into a million pieces. He took so much of me with him. I begged God to take me & let him live! My plan was not Gods’. I can’t get pass the pain. My heart is broken beyond repair. The emptiness, londliness & despair is just that! I want to get whole again! Tears come whenever. I have had to stop & think about my family & realize they all have been grieving, too, not just me! I had to let them know I’m here for them, too! So at night when I’m alone the tears don’t stop. The thought of him they come! Writing this is awful! Carolyn so sorry for your loss. Try looking up this support group in your area. I believe they can help you. Blessings. I, too would love (2) prints of this! I keep looking at it…it’s like it’s talking to me It’s touched my heart! Thank you. I do not know of any copies, prints or smaller versions of this beautiful statue. So sorry. Carolyn, I am so sorry. I joined this exclusive “club” that no one wants to be a part of 33 years ago when our 10-year-old son died suddenly from a brain hemorrhage. As I’ve read all these posts it brings back the memories of that fresh, raw grief. I would encourage you and the others to search out a GriefShare group. It’s an amazing program. I wish they would have had it when my son died. There IS hope. I will always miss my son and there will always be tears that will come but we can survive and live a full life. Our daughter died in a car accident 11 years ago. I have never seen an artistic depiction, until today, that represents how difficult life is every day without her. Every. Single. Day. My belief is that as much as our love for her never ends…her love for us surrounds us every day…frozen in time until we are together again. To the other parents and to those who have experienced profound loss…sending you love. Mo, to cancer a year ago. It is so heartbreaking to see how I really feel. He was such a sweet, caring son, brother ,Dad and uncle as well as a grandson,nephew and cousin to so many. It is tough to press on- I pray that God will give us all strength. I miss him so much. I,too, would like a print or small sculpture if anyone has any information to share, God bless all of us???? This sculpture says so much we cannot say but feel so very acutely. My husband and I lost our baby at 23 weeks after preterm labor on June 23 of this year. I couldn’t feel more like the person depicted in the sculpture. It’s comforting to know through such works of art that there can be healing and connection in our shared experiences, although many times painful. Sculpture says it all. My 43 yr old daughter died in w2005. I will miss her and love her forever. This will always be a group that none of us wanted to belong to. Just as this sculpture portrays the emptiness and sadness you feel never goes away. My daughter was nine weeks shy of her 16th birthday when she died. It doesn’t matter how old your child was or how long its been since they died, life as you knew it is over. Absolute beautiful piece of art. A picture like this is worth a 1000 words and actual feelings. Miss my son who passed away September 7,2017. Feeling empty is the best way to describe the loss of a child! ? I can only imagine that this is exactly how my daughter felt when she took her life after having her second child…Empty inside, not understanding what she was going through and feeling that no one understood her. This sculpture brings tears to my eyes! Avoiding other people from having this same emotion has been my goal for three years now, and it will go on until my last breath. Beautiful artistry. Words can not express this heartbreaking and beautiful art work. So, true, when I lost a child nothing can ever full the hole it leaves. I lost my daughter Tine Rose in a house fire 1 month before here 3rd Birthday in 1969. My son was killed in a single car accident 13 years ago. He was 21 almost 22. My other son was killed in a motorcycle accident in Aug 2017. He was 30. This sculpture displays the intense emotion of grief. I too would like a small sculpture picture. That sculpture is amazing. No words! Anyone who has gone through a loss of a child …no matter what the age can relate to the emptiness that we r left with! I lost my son Jason in 2016 and every day is a struggle. God bless all of us that have experienced a loss ! If there is a print of the sculpture please share info. My 34 ur. Old son died in a motorcycle accident on June 11,2016. He left behind a beautiful wife & 6 mos. old baby girl who is now 2 1/2. She looks like him & every time I see her I think of all he is missing & that she won’t know him at all except what we all tell her but it’s not the same. This sculpture is my feelings to a “T”. I understand what ur going through. 2 years down the road & I still feel this way. Oh things are “better” in many ways from the 1st year but the waves of grief come & take me by surprise now. God Bless You & just know it will get “easier” for lack of a better term. that is exactly how I feel. my daughter, Diane, died this June 13th. I feel I can’t go on. Denise, find a GriefShare group in your area. Go to GriefShare.org, to Find a Group. It’s a wonderful program. Look it up. You won’t be sorry. We lost our 10-year-old son 33 years ago. I wish I’d had it back then. There is hope for healing. Denise , I know exactly how you feel. I didn’t think I would be able to “stay here” after losing my precious baby boy Austin who was one month away from being 23 on May 8, 2017. It’s been 14 months and it’s only been the last few weeks that I am starting to feel like I can breathe a little or that I’m not thinking of how to go be with him now or praying that God take me home. Take one minute at a time, one day at a time and know that it’s time you will be able to start doing something other than dwelling every single second on Diane. Your Diane died on my Austin’s 24 th birthday. My refuge has been other moms that lost their sons and my work to keep my mind from dwelling on him 24/7. This is the only way is to find something you can focus on. Prayers for you and all these moms and dads. Shannon, find a GriefShare group. Go to GriefShare.org to the Find a Group area. You don’t have to do this alone. Our 10-year-old son died 33 years ago July 24. I wish I’d had GriefShare then. There is hope. <3 This sculpture. Totally captures how I feel all the time since losing my daughter a few years back to cancer. Thank you for creating such a lovely sculpture. I love this sculpture! We lost our daughter 11 yrs ago she was only 29 . People think that as time goes on you’ll get over it, but it just hurts so much you can’t ever get over it ! That was you’re baby you’re child !! If you have a mini sculpture or even a mini print of this I would be really interested in it . It’s exactley how I feel after losing my son, empty inside but still try to be happy somehow? This sculpture is beautiful.I lost my son last year.It was so sad.This is exactly how I feel.Empty. I lost my son suddenly 14 months ago while he was studying in college. He past away from a bleeding stroke and called crying for his mom when he knew something was wrong. I will never be able to stop the pain of not being able to comfort him and this piece represents how I feel. A beautiful piece of sculpture. I am one of the lucky Mother’s. My daughter was saved in a terrorist attack in Israel. I do have friends that have suffered losses and would like to get prints for them. You sure made tears come to my eyes. Kindly let me know asap about buying prints. I lost my 32 year old daughter 2 months ago. This sums up exactly how I feel inside. This sculpture is beautiful and spot on. I see this sculpture as meaningful for anyone who has lost any loved one, child, parent, spouse, partner……anyone who loved deeply. Please let me know how or where I may purchase the posted picture or a small sculpture. Many thanks. Oh my goodness – so very sorry for all you’ve gone through. I do not know of any copies, prints or smaller versions of this beautiful statue. So sorry. Wow. This is spot on. This is how we feel. ♡ Thank you. I do have joy and happiness in my life, even though our son Nicolai died! That doesn’t mean that the emptiness isn’t there. Our life’s are empty of Nicolai. He will not come home for Thanksgiving, not surprisingly show up on Sunday for brunch. We deal with that reality, with Love and Light! In the name of Nicolai, I pledge to stay living with joy, happiness, Love and Light! I am so sorry for your loss. I am sure Nicolai would want you to stay living with joy, happiness, Love and Light! This sculpture also spoke to me. My 35 year old son Sam died in Italy almost 4 years ago. I feel his presence, especially now during the first World Cup since he has been gone…he loved the sport of soccer. Totally understand after loss of my son. Even though I have joy in my life, this is how I feel many days. So sorry for the loss of your son, Jeannie. Losing a child doesn’t tear a hole in your heart…it rips apart your soul ! This sculpture speaks volumes to me, for I have lost two children. This is the first time I can actually see my emptiness that I feel and not just feel my emptiness. I am so sorry for your unimaginable losses. I lost my son, Robin, 9 years ago and this is exactly how I feel; OK on the outside but totally, totally empty. An amazing piece of art. I am so sorry for the loss of your son. Sending peace and prayers. This is a beautiful way of representing how I feel when I think of the seven babies I lost plus the one living daughter (now grown-up) who, as a result of mental health issues, has recently cut all ties with me and my husband. So very sorry for your incredible losses. Our 22 year old son died six months ago today in a motorcycle accident where he was a passenger. I have read most of the comments and it’s heartbreaking how many parents have lost their sons. Mine was about to leap into the next stage of life as a college graduate. I also have two daughters who give me reasons to get out of bed each day and get through this awful grief. What a powerful sculpture. I feel the gaping hole with my son’s absence. I am so very sorry for your loss. I can’t imagine. Thank God your daughters have helped you to go on. Thank you for Sharing – It is beyond understanding – I lost 17 yr old who battled Leukemia 4 years and 13 days prior to that her brother 20 years old was found deceased in the house by himself with the Dog. My husband in the midst of all this was diagnosed with NON-Smokers lung cancer (he was an athletic director) and based 4 months prior to the children at the age of 56 in perfect physical fit. All in 2010 Go figure what life dishes out and when you have no control. I am giving back to a non profit who helps families with critically ill children at no cost to the families. Adina’s Angels Fund at Friends of Karen (now have helped over 15,000 children in the past 40 years). I would love to get a print. My best friend lost her 3 month old granddaughter a year ago. It has caused so much pain and has torn the family apart. Beautiful and significant. My husband and I had a stillborn daughter over 30 years ago. She was our firstborn. We will always wonder what she would have done with her life. We did go on to have 2 boys. The pain of losing a child never goes away. We have grown to accept how life is. Almost lost our youngest because of prematurity, but he is thriving well. I have just lost a grandson. My Son and my daughter-in-law, have lost their youngest baby of 2 years old to a terrible drowning accident during a 4th of July Celebration at their home. We are all feeling the emptiness such a bright star burning out way too soon, his bright blue eyes confident smile would light up any room and any heart. Our family is devastated this baby has 4 older brothers, a sister and a baby sister on the way. 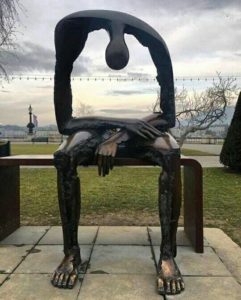 It’s hard to express the feeling you feel inside when you lose a child a friend of mine sent me your picrure of this sculpture and immediately the emotional connection was Unreal, that was exactly how our family is feeling but there is no way to describe it. , my son and daughter-in-law, being the wonderful and giving people they are have use this tragedy to honor their baby boy by donating his organs to give life to other children he so desperately need a chance to live. They thought it was their son’s Legacy to live on. I wish there was a sculpture just like this one made small that I could find to give my son and my daughter-in-law to give this gift of emotion as a way to heal by expression not through words. This is the most powerful thing that I have ever seen. We lost our Son to cancer ten months ago. It was esophageal cancer and it took out hearts right with him. This sculpture is amazing!! I had the amazing blessing of a very loving, intelligent, artistic, sensitive, vibrant, beautiful son for 39 years. When you are away from your child for a month or however long you start to miss them more and more, until you finally see them again. Your heart takes wing in that moment and as you embrace in that long awaited greeting you feel whole again. That feeling between yourself and your child is impossible to put into words and irreplaceable. When you lose a child that feeling of missing them and the pain that goes along with it does not diminish. Time can not heal it and the pain of missing them actually increases. There is no light of knowing they will walk in the door with that smile you love more than anyone else’s…ever again. On March 10, 2014 my only child took his life at the age of 39. Not expected…shocking and beyond understanding. So many broken hearts left behind in the aftermath. I can only pray that when God brings me “Home” that I will once more see that smile that is above any other smile in the world and I will once more feel “whole” again. I couldn’t have said this better myself. Exactly how I feel about my son. This month will make 25 years since my beautiful 6 year old baby girl Danica went to heaven. She died from toxic overload. Something that should never happen. This piece of art explains my feelings so perfectly for 25 years. That emptiness will always be there until I can hold her again. This is such a beautiful sculpture that depicts how it feels to loose a child. After my husband and I lost our daughter 2 years ago in a horrific car accident we have felt so empty and nothing fills that emptiness, nothing. Thank you for sharing this story with all of us who are hurting with the loss of a child. God Bless! We lost our beautiful daughter Vivienne in 1988 she was lost at sea and never found. It has been 30 years she was 14 years old. We have a son 2 years younger This sculpture tells how empty you feel even when your surrounded by oeople. Life will never be the same. You never think you will outlive your children. I’m very glad we had such a happy time with Vivienne we miss her hugs she was such a joy. I lost my only child Michael October 2015 at the age of 32. This sculpture really says it all. The emptiness that I feel, truly there are no words. Shortly after that, I became care giver to my mom – which is a full time job in itself. Mind you we got Michael’s diagnosis on 9/11 of 2015 & then my husband had a severe stroke in January on Friday the 13th. He was clinically dead, w/o oxygen for over 15 minutes. Well with the good grace of God & my son, my husband if back to normal. I know Michael (my son) helped with this miracle. My heart bleeds for all of us who lost a child. Spot on. That statue depicts how I feel inside after losing my 20 yr old son to an overdose! My heart is forever broken.. I know I did everything I could to help him but it was not enough to battle a crippling disease. My son, age 57, died last week. I still can’t really believe it. I have felt this way for over 37 years … my son should have turned 40 this year … he never saw 3. Thank you for this … it captures the feeling spot on … and Bless all of you who have lost a child. I’ve read most of the comments and I didn’t read anything about what else is in the piece. I also see a representation of the scream of pain with the loss of a loved one. It is the upper half of the work…it is almost a juxtaposition of two emotions, one of which is indeed meloncholy/depression, and the other is the raw, exposed-nerve touched by such great loss. anyone else see that or am I just imagining it? It captures my feelings completely. So empty without my Jenny. Killed by a distracted driver at the age of 21.. Miss her everyday. I too lost my oldest son 3 years ago. He had been married for less than 6 months and left his wife and my grandson who was almost 3 at the time behind. I wake up with him on my mind and go to sleep the same way everyday. I might put my thoughts of him off to the side but those thoughts are never and will never go away. I would very much like some kind of replica of this sculpture if anything like that is available. Tears are pouring from my eyes as I post this. Lost my daughter Lindsay (27) and her husband Eric (33) almost 6 years ago in a motor vehicle accident. After awhile you just tuck your grief away because you want to feel better, but it never really comes. Best you can hope for is to learn to live with the huge hole in your soul and to be thankful for the moments when you can experience happiness and joy, knowing that the sadness is never far away. The second I saw this sculpture, I said YES THAT IS IT. Thank you so much Albert. This helps so much. So very sorry for the loss of you daughter and son-in-law. Our daughter Aubrey Lee, three years ago. Her father and I are still numb and I know we always will be. The pain does not subside, does not go away. It is always there and always will be. It eats away, a lot each day at first, a lot each day ever after. I am so sorry for the loss of your daughter. It was 6 weeks ago that I had my last lunch with my son Liam and the next day I heard he died. He had struggled with addiction for so many years and although it was a heart attack that killed him, so did the drugs. He is at peace and for that I am grateful. I lost my daughter Jenne 16 years ago and I will love and miss both of them for the rest of my life. This sculpture depicts exactly what it feels like. I lost my daughter last June and not a second passes that I don’t think of her ?? I am so sorry for your loss. So very sorry. This piece brought tears to my eyes as did the pain in the comments made. I bury my feelings most days but not today. Three years ago July 3rd I lost my 24 year old son to suicide days before he was to begin his residency in Family Medicine. He left behind a twin sister who carries on his legacy as a Family doctor a brother and his mother all of whom live in grief. Thank you for your beautiful piece. It is not always easy having to cope with grief alone, even after many years. The best way for me to cope is to do something positive that benefits others and gives me a lift on her two days (birthday and memorial day Boxing Day). I still have bad days. Fifty-one years ago my 2 1/2 month old daughter passed from SIDS on Christmas Day. Fourteen years ago my 36 year old daughter passed from Leukemia on the day before Mother’s Day. There are some days we just cry; some people think it’s for no reason. Oh, there is a reason. The heartbreak never goes away……. I was coerced in surrendering my son to adoption in 1965 and have felt profound loss ever since. It changed who I was meant to be & created a gaping loss in my being forever. Even though we have been in reunion for many years now, it does not take away the defeated feeling & emptiness of the loss. Thankyou for this magnificent sculpture. I am so very sorry for all you have been through. Does anyone know if this is either available in print or an actual replicate of the sculpture? I would love to get one for my best friend who lost her son. I am so sorry but I do not know of any prints or replicates. So sorry. My son was killed in action in Iraq. August 1, 2005. This explains exactly how I feel. Absolutely sums up my life and the life of my children as we have lost my 14 yo son Xavier to gun violence. This piece is amazing . Thank you so much for sharing it. This is both beautiful and sad. I lost my son Jason 3 years ago to cancer at the young age of 41. Not a day goes by that I do not think of him. If only I could have one more hug, or to see his smile. My heart goes to all that have shared their pain. There is nothing worse than to bury a child. I too would like a print or sculpture. We lost our son John Benjamin in 2013. It is so difficult. Life is not the same, but we carry on the best we can. We try most of the time to be positive…as our son would want us to be. Our faith & love from family & friends help us to live day by day. We lost our 17yr old daughter over 40 years but it still hurts. My oldest grandson died 10 years ago aged 20. Sometimes the hurt from my losses overwhelms me. Then 5 years ago our youngest son had a very serious head injury which has left him with very serious brain damage. I suffered further heartbreak. I know I am not the only one and my heart goes out to anyone that losses a child. I also see (in the void ) the silent scream of the bereaved ..the head is like the back of the throat open in torment screaming out in pain …this is a very emotive sculpture …it is lovley …. Someone murdered my son Dec 1,2017. Larry Stewart jr was the love of my life. I need to learn how to live all over again. Sorry for your loss. Yes… there it is. The despair in the shoulders, the drop of the head, the empty arms and the gaping hole in the center. My daughter Ryan died on her 22nd birthday, May 24, 2018. Ian still breathless and almost speechless. This statue speaks volumes. My sister and brother-in-law lost my niece at 21 years of age to diabetes 10 years ago and three years later my nephew who was by then 21 died in a motorbike accident. We see their pain and suffering as it is part of their everyday lives. We as a family can just be there for them through the roller coasters of emotions that consume them and us, especially on their birthdays, Mother’s and Father’s day and Christmas time. They try their hardest to be strong and we are strong for them on those really bad days. This sculpture depicts that huge gaping hole in our chests when we cannot breath for the longing for them. I’m a bereaved mom of two sons…my eldest Joshua passed away when he was 15 and my middle son Jared passed away at age 33. Despite a 20 year timespan in between losses, I can undoubtedly tell you that the pain is as intense no matter how long I had my children with me on this earth. A parent can never “get over it”, we learn to manage our grief and take one day at a time to allow us to move forward. I miss my sons every.single.day. My cousin Leda lost 2 sons the same day within the same hour to a senseless murder last year by the hands of 2 thugs in retaliation of something their father had done over 20 years ago. My little cousins were in their 20s. This sculpture is beautiful, yet sad. It immediately mad me think of my cousin and her loss. I’m in constant prayer for Leda because she is so sad, bitter and empty. Are there replicas of this sculpture or prints? I’d love to purchase for her. I am so very sorry for your loss, Steve. We lost our son 4 years ago aged 23 to a 62 year old lady driver who turned right illegally on a traffic light. He died on the spot in 5 shorts minutes. When I saw this sculpture I immediately recognize myself as being that person in that sculpture.. Thank you to all who have posted here, much insight which helps and so many stories like ours. Do not know why God choose us for this pain and heart ache, never will understand who decides who lives and who dies. When I see a room full of people at a restaurant say, I think why are all these people a live and having fun an our Stefanos is not here. it is so unfair. Plus I think of all children who have died in much worst circumstances, from murder, suicide, great pain and suffering and how are those parents coping?? Even with our loss, as tragic as it is, there are parents with much worse losses to deal with, how do the cope? We are so grateful for our beautiful son, he is very special man and loved and is be remember by all. We hold an annual blood donation in his name which took place in Limassol Cyprus just this passed weekend and we collected 26 units of blood. Finally, we all need to try to stop saying we LOST our child but I do not know what word we should use. Suggestion please.? So very sorry for the loss of your son, Andrew. I lost my fir born son at age 4 days and my oldest son last year at the age of 40. This art peice is spot on in how I feel every day of my life since their losses. Thanking some that put me on Mr Maddox post of the sculpture Deborah Thaxton Palmer and my dear friend in this boat ride of bereaved parent (she lost all 3 of hers and at different times – I’ve only lost my only offspring, my son, Blake Peacock ) Beverly Amerson found your 7/11/18 totallybuffalo site post and shared it as did I. I shared it with my words “An artist’s rendering of grief that has touched so many of us ‘Bereaved Parents’ during Bereaved Parent Month that we are claiming it as our own! a Profound image of our hollowness and pain and emptiness from burying a child (even adult child) – but it is also symbolic of anyone’s grief unbearable of a lost loved one they treasured and would exchange places with in an instant, if the choice were given – I know i would! my heart goes to all who have lost a loved one and especially any parent riding in this rough sea with me and my wife in this boat load of people in this journey at sea! God Bless and God Bless us all RIP Celebrate Blake we STILL love you – until we meet you again in the arms of our savior, Jesus Christ!” Again thanks and I hope to contact that artist to thank him and try to get replicas! God Bless you Mary for this and I hope many will find it. Thank you Edwin. I am so sorry for your loss – what beautiful words. Thank you and God Bless! 13 years ago my baby boy when to be with Jesus. I didn’t lose him. I know where Brody is but still doesn’t stop the emptiness and the hole in my heart. This beautiful piece of artwork speaks so loud to my heart. I lost my beloved son Jeremy almost one year ago. My heart is severed and will never be whole again. Thank you for this exceptionally beautiful piece of art which depicts my life completely. An empty deep hole, with moments of joy, only to be reminded once again of the lonely journey those of us walk every day. So very sorry for your unimaginable loss. I am so sorry. I can’t imagine. God bless you and that sweet little girl and the rest of your family. My son Jeff died on July 9th, 2000, he was 25 years old at the time. I could never understand how big that hole in my heart was, now I know it is not just my heart, but my whole being. This Sculpture was able to speak the words that have been pent up inside of me for Ten years now! I lost my oldest Son and Daughter-in-law to a Murder-Suicide back in the Spring of 2008, and from that moment until I saw your Sculpture nothing had or was able to express what I was feeling inside. Instantly the tears started falling down my cheeks because for the first time I felt there is something I can now use to express how I feel on a 24 hour basis. Thank you from the depth of my soul for sharing your work with the World for I realize there are so many other’s like myself who have this same feeling that up till now no words were able to explain what I felt inside. Big hugs to my fellow parents who have lost a child, if they were 2 days, 2 years, 20 years, all you can do is keep breathing!!! This art work, sums it all up!! I NEED, to make a trip just to see it in person, my Travis has been gone 18 years, and think about him everyday, the entire month of June is just lost to me. It’s forever changed the person I was, the person that I’m today, and the person I’ll become in the future..
Until we meet AGAIN, my special angel? Compounded losses pile up, scars can never heal, the heart shuts down to avoid the pain, the soul becomes a bleak, dark hole…and no one can ever see any of it. It is no different from the air one breathes, always there but unseen. This is exactly how I feel, I lost my husband if 10 years, and our two precious daughters age 6 and 8 on June 11, 2010. In a very tradgeic accident, I was also involved but somehow survived. It’s been 8 years and every second it feels this hole gets bigger and bigger. I lost my precious son 1.5 years ago and am so empty. I will never be the sane?. I would love to have buy this beautiful print please ! Thank-you si much for such a beautiful piece of art. We lost Randy, our 8 year old son, over 30 years ago and I still dream that he is alive but only I could see him. The emptiness will never go away. The sculpture is beyond amazing. I lost my brother my best friend last July 14, 2018. When I viewed this sculpture all I could do was cry. I’m really just now beginning to feel myself again. This sculpture say everything I couldn’t speak when asked how I’m doing. Please put this in print. It has an healing affect. Please. This sculpture embodies the deep and enduring heartache and sorrow of all the people who lost someone on September 11, in one of the most horrific events in U.S. history. I would like to purchase a small print for a friend who just lost her daughter. Please let me know how I can go about doing this.